The Arclight Infiltration Promo Week has made an appearance on Live Shards. The following is a guide to everything you need to know about this Promo Week. Note2: This is not the Arclight Ascendency Promo Week, which is a separate event. Nightmare Lifter Mount obtained via rare chance from Limited Edition: Nightmare Lifter Trove. Arclight Lifter Mount and Storm Legion Lifter Mounts obtained via PRI Quartermaster for 850 Magnetic Containment Bottle currency. Magnetic Containment Bottle currency; ~5-10 from Limited Edition: Lifter lockboxes and 10 from each Arclight Infiltration Quest. Complete Carnage: Scout Captain Feldain to complete “Lifter Larceny” achievement and obtain a Limited Edition: Storm Legion Lifter lockbox. (this can only be done once per character). Arclight Infiltration is a Promo Week (Rift Store Promotion) centered around the Lifter Mounts such as Arclight Lifter and Storm Legion Lifter. It may occur multiple times in a year. Limited Edition: Nightmare Lifter lockboxes (Red; Transcendent) go up on the Rift Store for 700 Credits each (630 for Patron) during the Promo Week. They contain a rare chance at a Nightmare Lifter Mount. There’s also daily quests to earn currency used to purchase Lifter mounts from a PRI Quartermaster NPC. The Nightmare Lifter Mount is the latest lockbox-obtained mount in the Arclight Infiltration Promo Week. The mount adjusts to your fastest mount speed or 155% mount speed. It is an account-wide unlock. The consumable is tradeable prior to being used. As a very rare chance from the Limited Edition: Nightmare Lifter Trove available from the RIFT Store -> Chests & Keys during the Arclight Infiltration Promo Week. The Crystalline Lifter Mount is an Earth-themed Lifter mount filled with colored crystals and a core that looks like a cut-out of a geode. It was previously available as a rare chance drop from the Limited Edition: Crystalline Lifter Trove, but that is not available in the current Promo Week. Necrotic Lifter Mount – Front View. Thanks to Drkirb@Deepwood for modelling! The Necrotic Lifter Mount uses one death-themed skin. It has a purple/black pulsing vfx that comes from the bottom of the lift as well as two trailing purple vfx at the back. Necrotic Lifter Mount – Side View. Thanks to Drkirb@Deepwood for modelling! The Necrotic Legion Lifter Mount cannot be obtained other via player trading. It was initially obtainable through the Limited Edition: Necrotic Lifter Trove, but that trove is not available in the current cycle of the Arclight Infiltration Promo Week. It might become available in a future Arclight Infiltration Promo Week. The Arclight Lifter Mount uses a brand new ‘hover disc’ model which hovers in the air and looks like an armored sting ray. Blue vfx comes out the back, like a sting ray’s tail. The mount adjusts to your fastest mount speed. PRI Quartermaster at Arclight Ascendency quest hub or Tempest Bay for 850x Magnetic Containment Bottles (quest currency). The Storm Legion Lifter Mount uses one of Crucia’s many platform designs. It has a middle blue glowing strip as well as lightning vfx at the bottom. The Arclight Infiltration achievements are found under Achievements -> Promotions tab. Carnage: Scout Captain Feldain. Kill Captain Feldain. He spawns in two locations – either Normal Mode King’s Breach or in the open world inside Trollblight Caverns. He can appear just before the entrance to the bunker where the last boss in Normal Mode King’s Breach (dungeon) is located once you kill the last boss. You must mentor down to around Level 35-42. If you are soloing this, a Level 65 mentored to Level 42 should be able to kill him with a bit of self-heals. He can also appear in the open world inside the Trollblight Caverns in Scarwood Reach (/setwaypoint 3225 4448). Be sure to mentor down to around his level before attempting to fight him. The Arclight Mastery achievement is a meta achievement requiring that you complete the three promo-specific adventures a couple of times each. These missions are Minion missions that are only unlocked with the Minion Card: Jineth. In order to see the new “Research Arclight Lifter” adventure cards, you need to first send Jineth on a mission and keep him in your active minion slots. You can put him on any adventure, even the 1min adventures – just don’t claim him. Whilst Jineth is on an active mission, a new adventure will appear in 5min/15min, 8hr and 10hr adventure deck. Completing the Arclight Mastery achievement gets you the Minion Card: Archaeologist Herim (Hunting, Artifact) who is also an Attractor Minion that attracts new artifact adventures. There’s 3 Daily Quests and 1 initial one-time-only quest. Each quest rewards at least 10 Magnetic Containment Bottles used towards obtaining the PRI Quartermaster version of the Arclight Lifter and Storm Legion Lifter mounts. 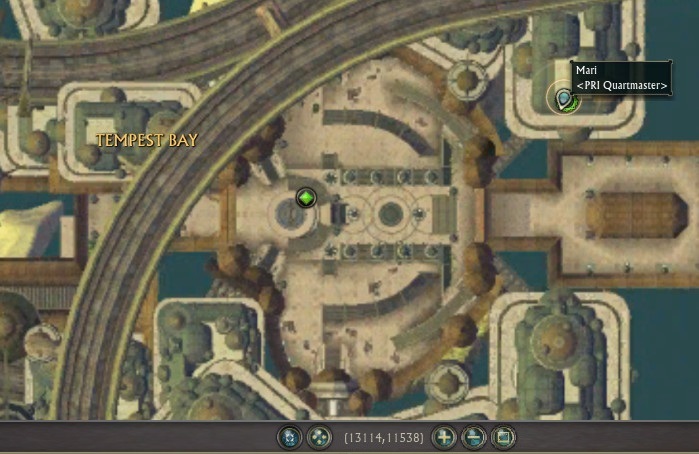 Both quest givers can be found at the bottom-left corner of Scarwood Reach in Mathosia, left of Perspice (defiant porticulum). /setwaypoint 3337 4635. You pick up the Attractive Proposition quest from Klein at the Arclight Infiltration quest hub. He asks you to talk to Stofie (the lobster) who is right next to him and that will complete the quest. Rewards: Minion Card: Jineth (Attractor Minion) + 10x Magnetic Containment Bottle. The Magnetic Containment Bottle is the currency used to purchase an Arclight Lifter Mount or Storm Legion Lifter Mount at the PRI Quartermaster (there’s one at the quest hub). Note: This is a one-time quest. Once you complete this quest, Klein will offer a choice of one of two dailies. Arclight Reacquisition is a daily quest picked up from Breana at the Arclight Infiltration quest hub. It requires that you defeat 5x Legion Infiltrators. The Legion Infiltrators are found on the map in Scarwood Reach with a small Arclight Lifter mount icon. They are Level 35. You must be mentored down to around Level 35-42 (as long as the mob’s name isn’t gray to you) to get credit for the quest. Mentoring down to Level 42 should be enough for Level 35 mobs. Note: The mobs have a bit of hp and can hurt for a mentored down player – make sure you have some heals or self-preservation in your spec if you are trying to solo these mobs. They respawn after a while, although shard-hopping can help speed things up. “Activating Arclight Attractors: Promotional (Daily)” is one of the daily quests you can obtain from Klein after completing the Attractive Proposition quest for the first time. You will need to choose whether to do this quest or the “Long and Short” version. The Promotional quest requires that you do the Promotional minion adventure found in the Promotional (10hr) adventure deck. This mission is called “Research Arclight Lifter Power Source” and can only be obtained whilst you have the minion card: Jineth in an active minion slot (i.e. on an adventure). Just put Jineth on a 1min mission and don’t claim him, and you’ll be able to eventually find the Power Source adventure in the 10hr deck. “Activating Arclight Attractors: Long and Short (Daily)” is the other daily quest you can obtain from Klein after completing the Attractive Proposition quest for the first time. You will need to choose whether to do this quest or the “Promotional” version. The Long and Short quest requires that you do the Long and Short minion adventures found in the Long (8hr) and Short (5min/15min) adventure deck. The missions are called “Research Arclight Lifter Propulsion Systems” and “Research Arclight Lifter Manufacturing Techniques“. These missions can only be obtained whilst you have the minion card: Jineth in an active minion slot (i.e. on an adventure). Just put Jineth on a 1min mission and don’t claim him, and you’ll be able to eventually find the Propulsion Systems adventure in the 5min/15min deck and the Manufacturing Techniques adventure in the 8hr deck. Hope this guide helps you get your head around the Arclight Infiltration Promo Week, and good luck on obtaining your Lifter Mount! So if you only got one minion slot you can’t complete the event-missions? Yes, that seems to be how the Attractor Minions work. You have to have the Attractor Minion in an active minion slot in order for the attractor minion’s adventures to appear in the 5min/15min, 8hr and 10hr adventure decks. I think you can use new ‘shuffle’ feature while Attractor minion holding your only slot. Yes, it will be costly in aventurine. Ah, you make an excellent point Amtoru! That should allow you to obtain the promo adventure without needing more than one slot. Although, if the adventure is removed as soon as you claim the mission that your Attractor Minion is on, that could still cause issues for players with only one Minion Slot. I have a proble with this quest. My level 27 character arrived at the questgiving location, but while he can talk to Stofie about minions, none of the questgivers (Klein, Breana) have the green quest marker symbol above their heads nor do they talk when right-clicked. Has anybody else had this issue? I would love to be able to participate in these quests, but they aren’t showing up for me. Have you tried shard-hopping? (Right-click your portrait and select a different shard). That might fix things up – I recall a guildmate having this issue and it was fixed by shard-hopping. If you still can’t see the quests, there could be a minimum level requirement – probably somewhere around Level 30 given the zone the quest is located in. This is Trion microtransactions for raking cash 101. Sorry, being cynical. I think there’s not a single promotional event been in amount you could actually farm the promo currency to get the nice bit (mount normally). I think players who have done every Budgie quest since they first came out probably have enough for a Budgie mount. But it does take time for those who purely go via quest-only. If you wait a few weeks the platinum price on the Storm Legion Lifter mount will probably go down. For instance, the other Promo Week lockbox mounts are at around 3k platinum on the AH most of the time (except the more recent ones like the Arclight Rider mount). Is there a known issue with Jineth being level 5 and not having that step of the achievement complete on any alt but the one you were on when it got level 5? this is ridiculous, have jineth on an adventure and the 10 hour mission is not popping up, i have 5 minion slots and used shuffle about 12 times, used over 20k aventurine trying to get the mission with no luck, is this intended? Next shuffle would cost me 2k aventurine, i have like 300 left.. The 10hr promo mission is randomly added into the 10hr adventure deck; each shuffle or adventure you go on will put that adventure on cooldown so you should have a higher chance of getting the promo adventure the more 10hr adventures you do/shuffle. Snedhepl has stated you’re 6x more likely to get the promo mission than the other 10hr missions. The other issue would be if you log back in after daily reset of the minions, in which case the adventures will be shuffled again. If you claim Jineth and then put him back onto an active slot, that might refresh the promo mission’s position in the deck as well. For all of these you only need to mentor down to level 42. At 43 it all goes grey. It generally is around 7 levels above the mob. Thanks for the info Rhumble! Is there any point to the Heirm card other than 2 extra artifact adventures? Are they special in some way? There’s no point to them other than adding two extra artifact adventures per deck whilst Herim is active in your minion slots. Ok I got Jineth on 8h mission go bed, after morning reset, I got Jineth on Claim and I stay with it. First mission on 10h is Arclight, send minion on it. Spam few 5/15 got mission for that, then spamming 5/15 to get another mission and nothing happens, 8h mission work for spent some aventurine on shuffle. What should I do next? Keep jineth on claim and wait till next reset or take him down from his mission and try to send him again? If I do that way next Arclight card will be added to each deck? Not 100% sure on that. I know if you remove Jineth all attractor missions associated with him are removed. If you put him back in, the attractor missions will go back into each deck, but not sure if they will still be on cooldown or if the cooldown has been reset. The minion daily seems to autocomplete for some reason in this current promo week, so you don’t have to do them. Given that the minion adventure requirement for Lifter Larceny was removed in this week’s hotfix, perhaps the minion adventures are not working properly right now. That said, you need to have the attractor minion Jineth in an active minion slot to unlock the other adventures.